Arsenal boss Arsene Wenger has revealed that the Gunners tried to sign French midfielder N’Golo Kante twice before his big-money move to Chelsea. 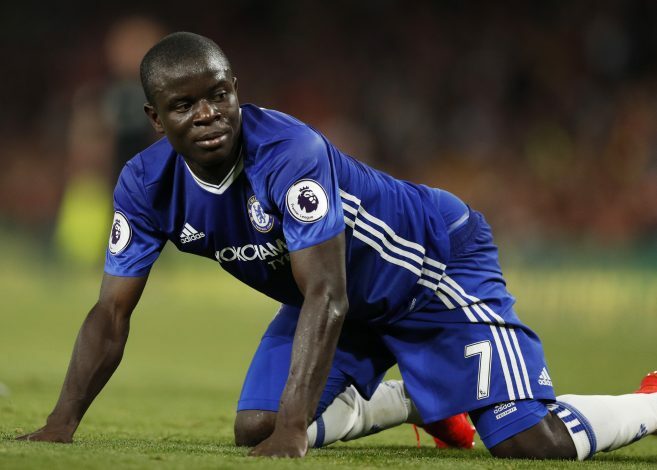 Kante, who was a key player to guide Leicester City win the Premier League title last campaign, joined Chelsea in a reported £30 million move last summer. The tireless midfielder has started in all but one Premier League match for the Blues this season and Arsenal manager Arsene Wenger has claimed that the North London club were keen to sign the France International. “Have I looked to sign Kante? Yes. When he was in France and when he was at Leicester. Earlier this season, Arsenal stumped Chelsea 3-0 in the reverse fixture of Saturday’s game, but Arsene Wenger insists that the title favourites have resolved their defensive fragilities since. “I feel Chelsea have found a better defensive balance since we beat then 3-0 at home in September. They are very good in transition. I watched their game against Liverpool and Kante had a huge impact in their team,” Wenger added. Arsene Wenger also confirmed that Welsh midfielder Aaron Ramsey will be out for about three weeks with his calf injury before revealing his interest to sign Monaco forward Kylian Mbappe, who has been dubbed as ‘the next Thierry Henry’.